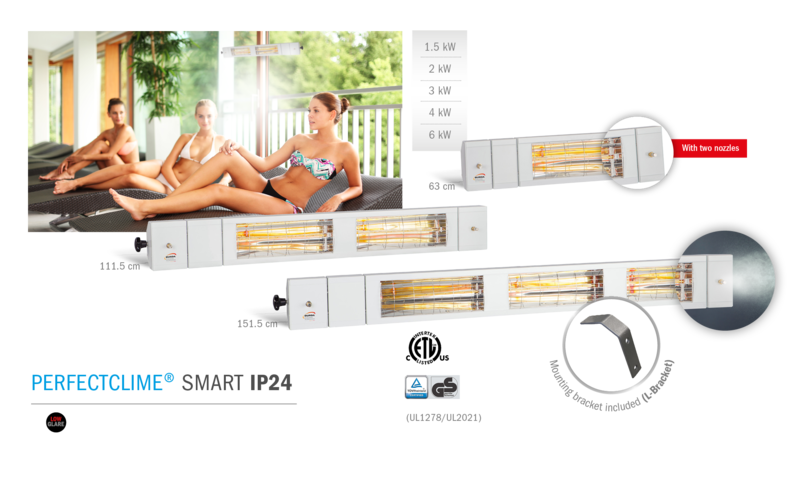 The first Heating & Light & Cooling Sensation! 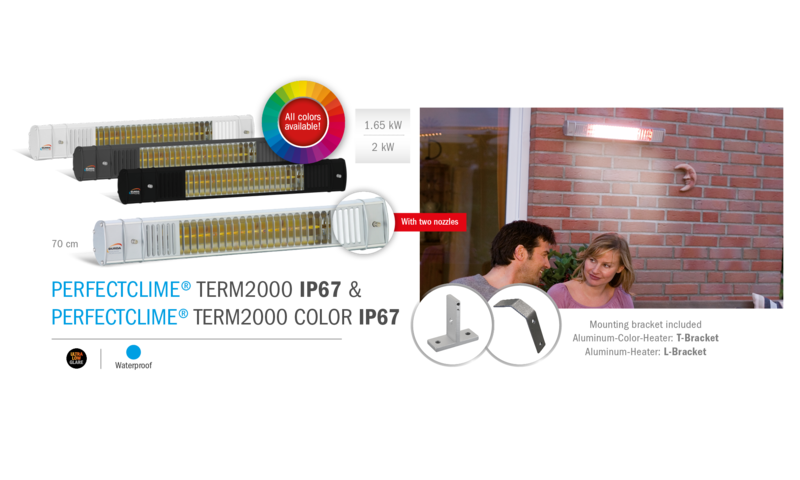 The uni­que com­bi­na­ti­on of per­fect tem­pe­ra­tu­re and light of the PERFECTCLIME® TERM 2000 IP65 L&H gua­ran­tees an indi­vi­du­al “feel good” atmo­s­phe­re – at home, in the restau­rant or whe­re­ver nee­ded. Once again BURDA Per­fec­t­Cli­me deli­vers with the mul­ti­func­tio­n­al PERFECTCLIME® TERM 2000 IP65 L&H FIX the best pro­of for hig­hest pro­duc­tion and mate­ri­al stan­dards – wit­hout any com­pro­mi­se. PERFECTCLIME® is only available from us! Under opti­mal con­di­ti­ons, the per­cei­ved tem­pe­ra­tu­re can be lowe­red by up to 15 degrees Cel­si­us (with the coo­ling noz­z­les) and increa­sed by up to 10 degrees Cel­si­us (with the hea­ting tubes)! 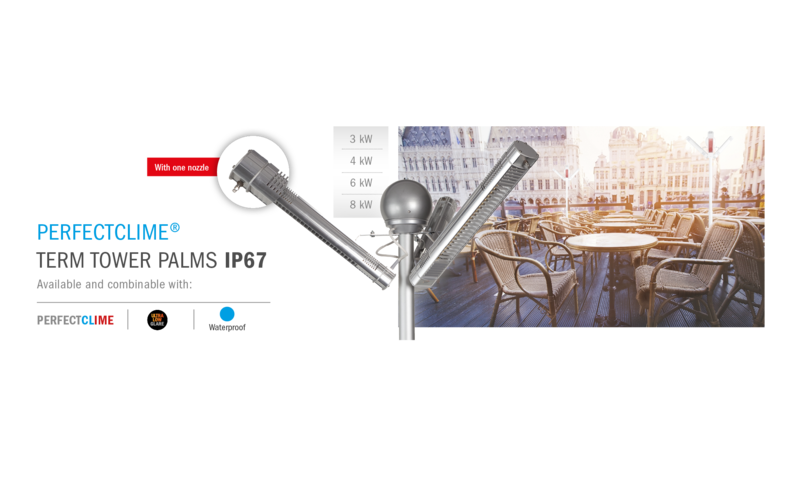 The PERFECTCLIME® TERM 2000 IP65 L&H FIX is equip­ped with two firm­ly instal­led halo­gen lamps, as well as two coo­ling noz­z­les atta­ched to each side. 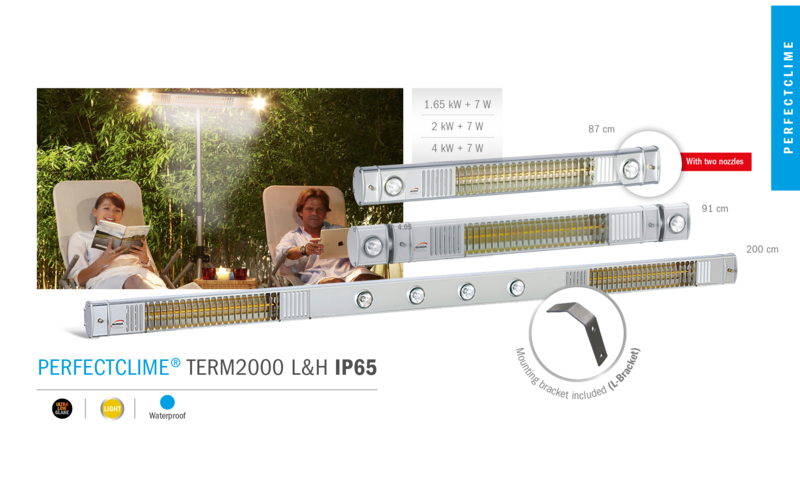 The illu­mi­na­ted hea­ting and coo­ling radia­tor is avail­ab­le with out­put levels from 1.0 kW to 1.65 kW up to 2.0 kilo­watts, and can optio­nal­ly be orde­red in the ULTRA LOW GLARE ver­si­on with 80 per­cent less red light. For atmo­s­phe­ric effect ligh­t­ing, the halo­gen lamps can be exch­an­ged for color­ful ligh­t­ing fix­tures. For the start-up pro­ce­du­re with pump and sup­ply line, we offer you a lar­ge pro­duct selec­tion in our PERFECTCLIME® ACCESSORY Cent­re. 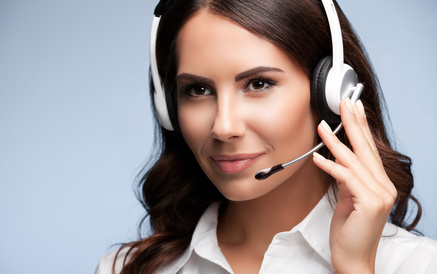 The tem­pe­ra­tu­re and ope­ra­ti­on can be easi­ly con­trol­led by using equip­ment from our CONTROL cent­re. A new quick-assem­bly sys­tem ensu­res simp­le moun­ting on the wall or cei­ling. To do this, plea­se ensu­re a clearan­ce of 2.5 to 2.7 meters to objec­ts or per­sons. The deli­very con­tent inclu­des an assem­bly kit with inst­ruc­tions. The hea­ter is equip­ped with a 1.9 m cable, inclu­ding a shock­pro­of plug. A water con­nec­tion is requi­red befo­re the PERFECTCLIME® radia­tor can be instal­led. Water is led through a hose into a pump, whe­re it is pre­pa­red as a coo­ling mist for the coo­ling noz­z­les with a pres­su­re of 60 Bar. PERFECTCLIME® access­ories inclu­de pumps and instal­la­ti­on requi­re­ments for the mis­ting sys­tem, as well as repla­ce­ment parts and access­ories for a tech­ni­cal­ly smooth coo­ling ope­ra­ti­on. Are you loo­king for a way to install our sys­tem in a short time, and also quick­ly assem­ble and dis­as­sem­ble it? Then our clam­ping assort­ment is the right choice for a secu­re posi­ti­on and quick assem­bly. Dim­mer, moti­on sen­sors and soon our new BURDA App for com­for­ta­ble, cost-effi­ci­ent radia­tor ope­ra­ti­on sup­ple­ment our assort­ment of CONTROL access­ories.